Our project is an infrared (IR) tracking system. A beacon, placed on the object to be tracked, continuously emits infrared signals in all directions. The signals coming from the beacon are detected by 2 IR receivers mounted on 2 stepper motors, which rotate independently and are in separate locations. The direction each receiver is pointing towards allows the CPU to determine the position of the beacon via triangulation. The position of the tracked object is then displayed on the TV, where the center point is the middle point of the 2 receivers, and the distance and direction are displayed on the LCD. 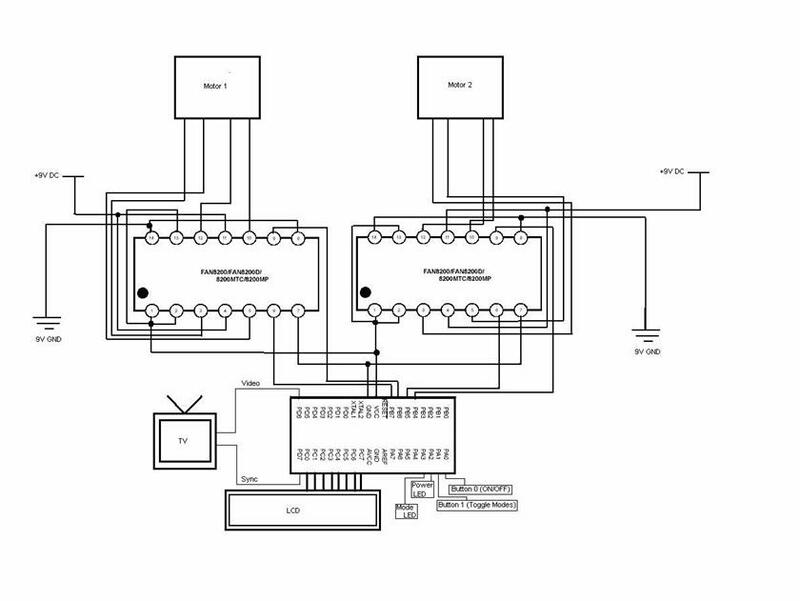 Our initial idea was to design a system consisting of an emitter and a receiver which would keep track of the emitter. We wanted to build a cheap beacon that you could throw in a car or laptop, or attach to your pet (or maybe individuals? ), and be able to monitor its motion on a screen in real-time, similar to those gadgets in spy movies. Our goal was not to locate very accurately where the tracked object is, but rather to alert the user when the object is undesirably moving (car being stolen) or moving outside a given perimeter (pet has escaped), and give enough location information to allow plain tracking and/or recovery of the object. We originally considered Radio frequency, since its range is good enough for the applications we had in mind and it goes through walls so can be used outdoors. Similar existing system are GPS (using satellites), and Radio triangulation (using antennas on buildings), but these are very expensive (over $600 for Lojack car security system). Since there is no accurate unvarying relationship between signal strength and distance, we decided to use 2 rotating directional antennas. However, we quickly abandoned RF because of the issues of cost, multipath, fading, interference from other sources, and the difficulty of making reliable directional antennas. So we decided to use infrared instead. However IR requires line of sight, so we could only test it indoors, and within a small range. Since IR emitters are very directional, we just placed several of them to point in all directions. When the system is turned on, the 2 motors start turning in opposite directions until an IR source is found or a full rotation is completed. The motors stop independently when each sensor detects the beacon, and the motors remain while the beacon is not moving (low inputs from the IR receivers). Once the input gets high (target moved), the motors immediately turn a few steps in one direction, then in the other direction, increasing the step size every time until the target is found again. The motors �remember� the previous direction they had to turn in, so that next time it starts looking in that direction first, because we are assuming that if the target is moving, it is more likely to keep going in the same direction. This enabled us to continuously keep track of fast moving object. Since we made use of the NTSC video code, we had to adhere to strict timing requirements in the software. To this extent, it forced us to keep the interaction between hardware and software as minimal as possible. We tried to be as conservative as possible and only kept the code that was absolutely vital to our application. The result of this is that the hardware became slightly more complex to make the software simpler. For example, we used control circuitry to handle operation of the bipolar motors which made the software simpler as we only needed to specify two outputs per motor instead of four. Also, we used the LMC555 oscillator to generate the 38kHz infrared wave on our emitter object. This hardware saved us from having to generate the signal in software and simplified our lives greatly. We did not explicitly reuse code from earlier projects or anything found on the web since the majority of work we found online involved the use of unipolar motors while we built our project around bipolar motors. The difference lies in the control circuitry we had to use (FAN8200 vs. ULN2003) as well as in the pulse sequences that need to be generated by the control circuitry. The video code we used was provided to us by Professor Land. We did not reverse engineering a design nor did we use anybody else�s design. As far as we could tell, no earlier project attempted to track and find an object using infrared sensors. We do not believe there are patent opportunities for our project as there exist more sophisticated tracking devices already on the market (GPS, etc) with greater range than our small scale system. We did not encounter any existing patents, copyrights or trademarks which would affect our project. All code referenced in our project was available in the public domain and we credited all sources we used in the project. There are no copyrights or patents on the search algorithms we used to track the moving object. 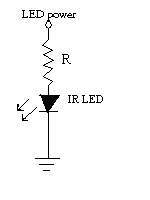 The IR emitter is simply an LED which emits light with wavelength typically around 950nm. Our first dilemma was to choose between IR phototransistors (transistors acting as variable current sources with the base voltage determined by the amount of light hitting the transistor) and IR modules (whose outputs are normally high and are set low when an IR signal at a specific frequency is detected). We tested both types of receivers, and we found that IR phototransistors were very sensitive to daylight and had a very small range of usage (it would not detect any signal coming from a source more than 5 cm away). The IR modules, on the other hand, are quite robust and detect signals farther than 3 m, but the transmitted signal needs to be frequency modulated. Another disadvantage is that the output of the modules is either high or low, whereas it is analog for the phototransistors, which would have allowed us to quickly determine whether the receiver is rotating in the right direction (the signal would get stronger) while searching for the beacon (as it moves, the signal strength goes down). 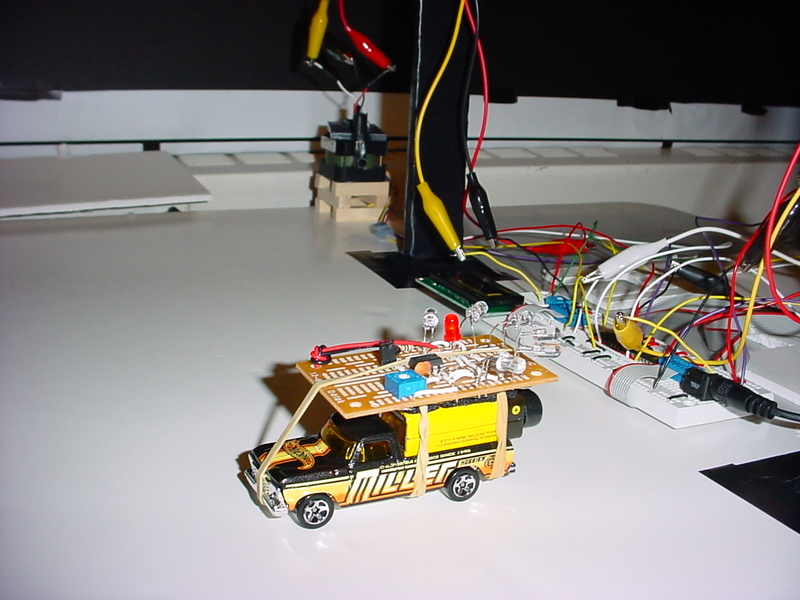 We used a LM555 with a 9V battery to drive 6 IR LEDs emitting in 180� (with 36� between LED directions). We tested a 180� angle IR LED, which does indeed radiate in every direction in a half-plane, but it had a very limited range (a few cm). We used the LM555 (from National Semiconductors) in astable mode (in which it triggers itself and free runs as a multivibrator) to generate a square wave at 38kHz. We used the circuit shown below (Fig. 3) as a starting point for our emitter. The circuit we built is shown in at the bottom of figure 3. With the values of R = 20k and C = 1nF we used and a 10k trimpot, the frequency of our square wave can be set in the range 36kHz < f < 72kHz. Setting the potentiometer to about 8.9kΩ, we get f = 38kHz, and D = 0.24. We also added a switch, a red LED which illuminates when the switch is closed to indicate current flow and proper operation of the circuit. We were happy to see that the circuit worked as desired the first time we tried it. Then we tested different ways of connecting the IR LEDs and tried different resistances to drive them. All the 6 IR LEDs are connected in parallel for optimum radiation power. However, in the end, we realized that the IR receivers made directional did not detect the emitter as far as expected. This is because not enough current was drawn to flow into the 6 LEDs in parallel. 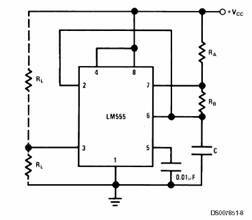 We thought about improving the circuit by connecting the LM555 output to a TIP31 (npn transistor) through a 5V voltage regulator LM340T5. This way the 6 IR LEDs would draw current directly from the battery (which would thus shorten the battery life though). However, we were unable to finish testing our new circuit and stuck with our original design. We tested a couple different IR receivers, and the best we found was a TSOP41 38kHz receiver module from Vishay (although this was a sample part). 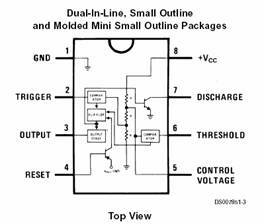 The module is shown along with its internal block diagram in figure 4 and the circuit we used it in. Figure 5. TSOP41 Reciever, block diagram, and test circuit. Because the receiver detected signals coming from a 60� angle, we attached a white straw covered with black electrical tape on top of the sensitive area to make it directional. Since the outputs of the modules are either 0 or 1, we could connect them to any port on the microcontroller and read them simultaneously. However, when testing the system with a phototransistor (with analog ouput), we had to use the ADC in port A and perform the A/D conversion for each sensor one at a time, which is another reason why we abandoned phototransistors in favor of these �digital� receivers. This allowed us to avoid using the ADC which helped avoid timing issues given that we extensively use the NTSC code and there is limited time there to handle location, tracking, and displaying of the beacon. 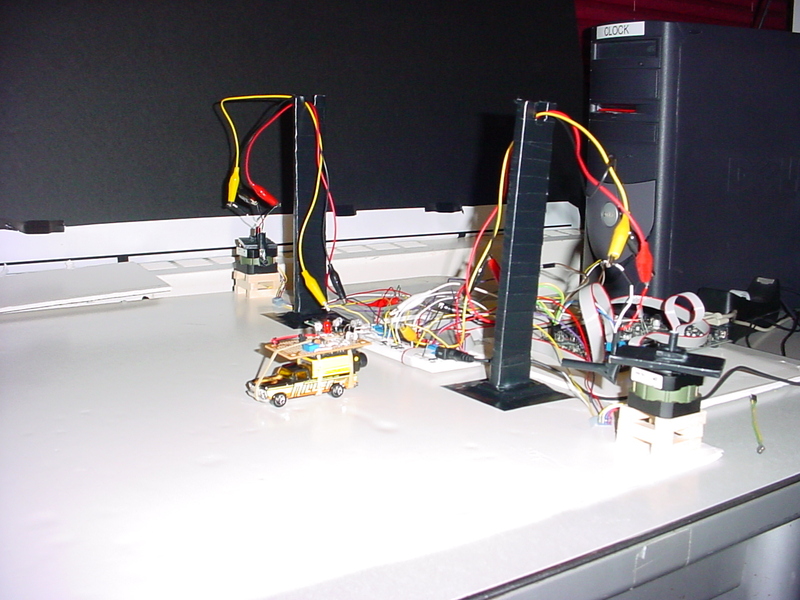 We used two bipolar stepper motors to control the rotation of the IR receivers in our radar system. The receivers were mounted on the motors which were then rotated in a �sweeping� pattern around the system space to determine the location and path of the emitter object. We started out building our radar system using the simple unipolar motors available in the lab before we received our bipolar motors from Jameco. Table 2. Excitation sequence for our bipolar motors for 1 rotation CCW. Since we used 2 bipolar motors, we needed two FAN8200 control circuits. We needed to specify the inputs (IN1 and IN2) on each FAN8200 in order to achieve the correct excitation sequence shown above in Table 2. We hooked up Motor2�s control inputs IN1 and IN2 to PORTB.7 and PORTB.6, similarly, we connected Motor 1�s control inputs IN1 and IN2 to PORTB.5 and PORTB.4; this allowed us to write the following sequence to PORT B.7 and PORTB.6: 11, 01, 00, 10, 11 in order to get Motor 2 to turn 1 turn (1.8 degrees) to the right. 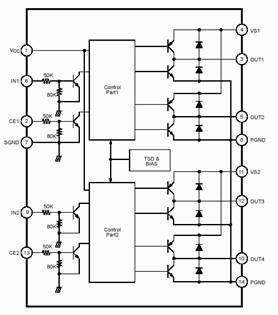 By writing this sequence of bits to PORTB.7 and PORTB.6, the FAN8200 then supplies the correct outputs to OUT1 � OUT4 in order to get the motor to turn precisely. The FAN8200 simplified our circuitry because it includes all the control logic and H-bridge circuitry built in. Bipolar motors require an H-bridge control circuit for each coil which allows the polarity of the power applied to each end of the coil to be controlled independently. Although our motors supported � stepping operation, we did not feel a need to make use of such a feature given the limited scale our system is operating on. If we wished to expand our simulation to a bigger scale, such a feature will definitely provide greater accuracy in the triangulation calculations, but at the expense of a longer pulse sequence shown below in Figure 9. To mount the IR receiver on top of the motor, we used fome core� (foam board) because it is very light yet quite rigid, easy to cut, and cheap. We glued a fome core platform (covered with black tape) on top of the motor�s spinning rod. We then attached the IR module (with wire soldered on its pins) on top of it, adding cardboard for more stiffness. 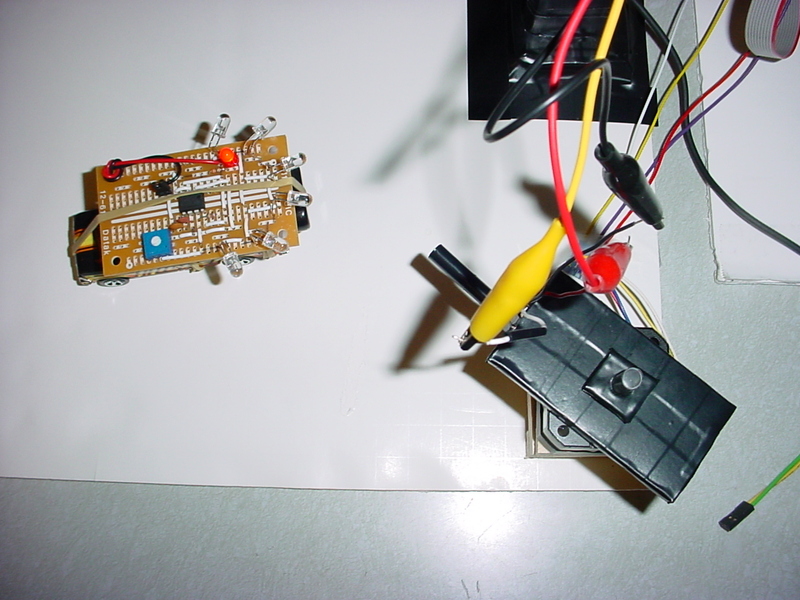 The tricky part was to connect the IR module to the microcontroller; simply connecting the wires form the modules to the board would make the wire twist when the motor would turn and pull it back, thus corrupting everything. So we designed a system that would allow the wires from the modules to turn around a group of 3 wires twisted together and connected to the microcontroller, while constantly making connection with only one wire. However, because the connection between the wire from the module and the wires to the CPU is not supposed to be tight (otherwise the wires would not revolve properly), it would sometimes fail to establish an electrical connection. So since we did not have the time and the means to improve it, we got rid of this design and simply used alligator clips. The wires connecting 2 clips are quite flexible enough, and we attached them to towers over the motors so as not to block the rotation of the motors. The motors were mounted on top of wooden pegs glued on a fome core board. The 2 motors were separated by 65 cm. The CPU consists of an Atmel Mega32 microcontroller on a STK500 board with pushbuttons and LEDs. We used the TV to display the position of the beacon. The center of the TV screen represents the middle point between the 2 motors. There are 2 modes of operation: display only current location or display all previous positions (follow the trajectory). In the first mode, only one blinking point appears on the screen which shows where the beacon is relative to the monitor. In the second mode, we observe a trace of the motion of the beacon. We changed the TV code slightly to use PortD.7 to output the sync pulse and PortD.6 to output the video signal, this involved changing a few lines in the Lab 4 code given to us by Professor Land. We also used the 16x2 LCD display available in the lab to display the distance of the beacon and the quadrant in which it is located (NE, NW, SE, SW). The LCD was connected to port C on the board. The switch buttons on the STK 500 board were also used. Buttons 0 is the on/off toggle and button 1 allows the user to switch between modes of display. The on toggle causes the motor to scan the area, find the initial max, and lock on to it. It then proceeds to track this max (the object) as best it can. If it loses the object it begins to search for it. The off toggle causes the motors to return to their initial state of operation. We used 2 LEDs on the STK 500 board. LED 1 is lit when the system is on, and LED 2 starts blinking when the beacon leaves a specified perimeter (alert). The unipolar motors differed in the sense that they had two brown wires to be connected to +12V DC and 4 colored wires corresponding to the two coil pairs while the bipolar motors have no such power wires. We noticed that both groups made use of a timer counter variable between successive pulse sequences sent to the motor. This is necessary because otherwise, the MCU will blast the sequences out at too fast a rate for the motor to process properly and turn accordingly. Using the unipolar motors, the max performance we achieved (without significant motor jitter) was by waiting approximately 1.95ms between writing successive pulse sequences to the MCU. By playing around with this timing counter, we were able to get the motor to turn at various speeds (increasing the interval between pulse sequences slows down the motors and decreasing the interval speeds up the motor). We decided against implementing variable speeds in our motor since we saw no advantage in doing so given our particular application. The unipolar test code we wrote gave us a good foundation to improve upon once our bipolar motors arrived. We simply changed the pulse sequences and port bits accordingly and achieved the same results with our new bipolar motors. With the motor movement code written and debugged extensively, we were ready to move on to the next task- object tracking. 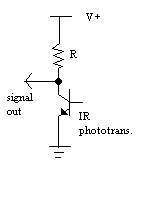 As explained earlier, we used IR signals to track the location of an emitter object in our field of vision. We mounted the IR receivers on the two motors and by using the motors to scan the field, we simply wait for detection of the object before proceeding. The first thing we tried was to get the motors to do a complete sweep of the field and record where it detected the object. Then, we instructed the motor to return to this location and wait there. We were able to successfully accomplish this using the unipolar motors at first and then the bipolar motors as well. Since there is only one beacon to detect, there is no point in making a full rotation first; so we improved the algorithm by simply making the motors stop once a IR signal is detected, which saves time. The next step was to track the object after initially finding it. We developed a seek algorithm that works in a simple manner where each motor seeks the object independently. Upon losing the object (no longer detecting signal at current location) we force that motor to scan the area in the vicinity of its last known location. We perform the search in a sweeping manner, increasing the search radius each time the sweep fails to find the object. We included some optimizations to the algorithm, by making some assumptions we feel are realistic and justifiable. First, an object moving to the left will probably continue moving in that direction. To take advantage of this, we store the direction each motor had to turn last to find the object and our search begins by first going in that direction until we hit our searchRadius limit and then we continue back in the other direction. Secondly, we use a combination of while and if statements to ensure that both motors track independently and are not dependent on the other motor in any way whatsoever. We also assume that if a motor completes a 360 revolution and is unable to locate the object, then the object has left our system�s range and the motor returns to its initial position. The final step was to try and display the object�s movement on the TV output with extra information displayed on the LCD display. This code was based heavily on Professor Land�s video code given to us in Lab 4. We display an initial circular ring showing the range of our radar system and one blinking dot which is the fixed location of the sensors (midpoint). The moving object is tracked and displayed through a series of video_pt statements. In software, we have enabled two modes- tracking and current location. Tracking keeps the path of the object displayed permanently on the screen while current location only displays the current location of the object erasing the path of the object as it moves across the screen. Once each motor has detected the objects location and has stopped moving, the LCD displays the distance to the object from the center (0,0) reference point and also displays the direction of the object in reference to this center point (NE, NW, SE, SW). We created a large state machine to be run within the LineCount == 231 part while the TV is not drawing anything. During this time, we scan the area for object, lock on to the object and track the object. During the tracking part, we output signals to the TV and LCD only if the object has moved and if both motors have successfully found it. This helped resolve some of the timing issues (jitter, etc) that we were seeing as we developed the code. The motor control code was relatively straightforward. We had some bugs initially with our tracking algorithm, but we quickly resolved those. The code to display output to the LCD and TV was not complex as most of it was covered in earlier labs. However, the problems we ran into came when trying to connect all three pieces together. Individually, all three sections of the code perform as specified, but when combined into a single piece of software various bugs arise. For example, when tracking and displaying the object on the TV screen, sometimes the points flicker. In other cases, we saw that using the LCD was problematic in that it would not display correctly. We checked the hardware and ran the Lcdtest.c file which worked perfectly. We could not resolve this problem and shifted our work to try to display the distance and direction on the TV instead of the LCD. Overall our tracking system did not work as well as we expected (and hoped), because of all the sources of errors that we mentioned before and that we did not have time to eliminate. However, our expectations were very high, and our system was doing what it was supposed to do despite the limited amount of time and the cheap hardware we used, and we were satisfied with it . Initially, we dreamed of implementing a search and chase system that would track a foreign object (which would be tagged with an IR beacon) and we would relay this information to another designated object which would then seek out and make contact with this foreign object. However, this proved too ambitious given the timeframe and budget, so we did not pursue this idea. We also wanted to try and use RF to transmit the IR receiver data to the MCU which would have simplified the wiring in our circuit greatly, but this proved too complex to accomplish within our timeframe. The motors move fast and are able to keep up with a fairly fast moving object. In fact, the data generated by the motor may be too fast for the TV to update (which did cause some erroneous tracking output). We did not see any jitter or flicker towards the end of our project after we decided not to use the LCD display to output our results. We fixed the motors 65cm apart and they are able to track a given object up to 1m. It can also track an object moving pretty fast provided it does not go back and forth. The sources of inaccuracy in our system are the initial shaking produced by the motors during the programming of the chip, the slight movement of the receiver on top of the motor and the small length of the straw (to make the receiver directional). With all these parameters, and given the separation of the 2 motors and the angle between 2 steps for the motor (1.8� for a full step and 0.9� for a half step), the accuracy of the system is around a couple centimeters within a 1m radius. This inaccuracy increases as the object moves further away. To improve the accuracy of the location measurement, one could increase the distance between 2 receivers and/or get better stepper motors with smaller increments. We also encountered some errors while testing of our design due to reflections on walls. Another source of error we encountered was due to the directivity of the LEDs. Our system produced some unexpected behaviors sometimes, when the LEDs were not aiming directly into the sensors. The IR receivers would be able to detect the incoming signal, but only when the motor is rotating, thus making the motor jerk going past the direction of the beacon then back and forth. Errors in the display of the location information come from timing issues in the code for the TV signal generation rather than hardware problems. We were unable to fix these bugs because they appeared randomly, and we suspect that they are due to the fact that so many different things are happening at the same time and very fast inside the code, thus probably interfering with TV signal generation. We drew power from the 5V supply provided by the MCU as well as a 9V supply to power the motors. On our emitter object, we used a 9V batter to connect the IR LED emitters. We do not believe our circuit poses a significant threat to any intelligent user of our system. The wiring is neat and easily identifiable so anybody with common sense can use our project without fear. IR has a limited range and high directivity; but even so, we made sure that no nearby groups were transmitting or trying to receive while working on our project. Beyond that, no other aspect of our project interfered with anyone else�s work. Infrared detection was not easy, because we can�t see infrared light so we can�t tell if a LED is emitting and there may be interfering sources such as daylight or emission from other equipment or reflections. Infrared tracking systems are not feasible in practice because it requires line of sight and because continuous tracking of emitters is not possible (a new search needs to be done once the target has moved). If we had to redo our project, we would buy (no more sample parts) better IR receivers and mount them on the steppers motors (better ones too) more carefully for better accuracy. We would make a better emitter that radiates in every direction and strongly (another option than the one mentioned earlier would be to use a reflecting cone on top of an LED which disperses the emission of a single emitter). We would also make some changes to the search algorithm to make it more robust against potential sources of errors. Another element to consider would be the possibility of tracking several beacons. We have acknowledged all sources we used to complete this project in the report as well as in the references section. We have credited the contributions of all others whose work we used or referenced in any manner. We sought help from Professor Land as well as the TA�s on numerous occasions and they were all willing to help. We made sure to obey all lab rules and safety precautions. We did not engage in any false or malicious actions during the course of this project since we used the lab in a safe and courteous manner. All claims made in this report are honest and are backed up with the according data where available or pictures if applicable. We reported our data in an objective manner and kept our project on a small, implementable scale in order to be realistic and feasible. We treated all people we worked with on this lab fairly and we did not discriminate in any manner whatsoever. 5. To assist colleagues and co-workers in their professional development and to support them in following this code of ethics. We helped other groups who worked on similar aspects of the project as us like determining the pulse sequences for the motors or assisting in mounting sensors appropriately to ensure a good quality signal is received each time. We would like to thank Professor Land as well as our TA�s Dave and Jeannette for their help during the course of the semester and during our final project. Special thanks for keeping the lab open late and helping us out with the annoying bugs we found.